This picture shows Durham County 152DUP Billingham's former Bedford/Miles ET in the City of Durham during 1985, by now in use as a BAT. This picture was secured after a very fast 400 yard sprint, as it moved off seconds after the picture was taken, and I'm definately no runner! I'm glade you sent a picture of this Bedford/Miles ET into the site Chris. 1956 Emergency Tender(picture #6673)but that was all aluminium finish. I've got a picture of this one also, but not taken by me.Thanks-nice photo. Added by Pete Matten on 07 February 2009. Despite the run, a lovely picture mate. Added by John Stott on 07 February 2009. Glad you like the picture gentlemen. However, I wish I'd taken as much interest or to have had the opportunity then to devote as much time to Fire Appliances as I gave to Cleveland Transit Buses. Then I might have had better coverage of the North East's Fire Appliance fleets. It's a case of the 'I wish I'd started earlier' syndrome. Added by Chris Hall Teesside UK. on 07 February 2009. This looks virtually identical to an ET in service at Sunderland CB in the 1960s, except that it had hinged front cab doors and wheel step rings. It was an early Bedford diesel, joining three AEC-Merryweathers, and was reputedly rather underpowered. An ADO at the station told me "it was faster than a bicyle, but not much faster!" Added by Rob Johnson on 17 April 2013. Added by Barrie Green on 17 April 2013. The Sunderland Machine was PBR500 new in 1960. References to it and pictures can be found in three excellent books (Fire Fighting in Tyne and Wear by Ron Henderson, Sunderland Fire Brigade by J.T.Bryce and Tyne and Wear Fire and Rescue an illustrated History by Dave Walmsley)All are a must have for anyone interested in the History of Tynesides fire History. Added by Chris Hall Teesside UK on 17 April 2013. Its Also The Same As Stockton's Old ET..
Added by Dave Todd on 18 April 2013. West Hartlepool CBFB had one similar too. LEF 297. Added by Andrew Middleton on 18 April 2013. There is quite a bit of Teesside association with the Bedford/Miles ET in the picture and 'Stocktons old ET' mentioned in the captions above. 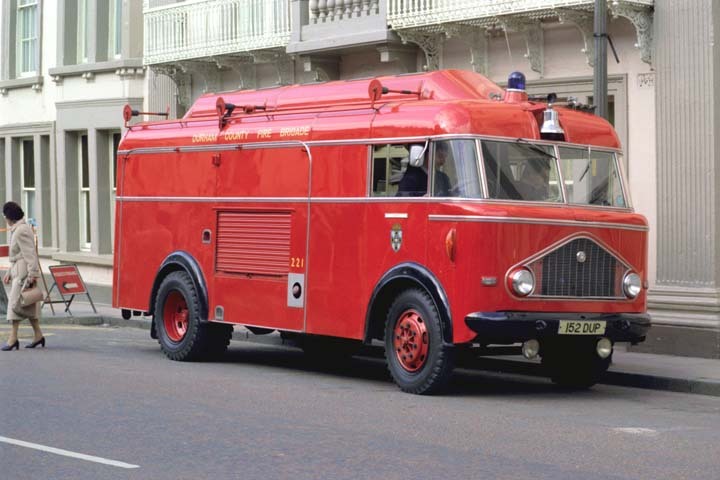 The one in the picture (152DUP) served its early years at the old Belasis lane fire station in Billingham moving elsewhere in County Durham when South Road (in Norton)opened around 1965. The West Hartlepool ET (LEF927)spent some time at South Road Norton around 1978/9 pending delivery of the now preserved Dennis ET (DAJ700T) The Hartlepool one also gained full Clelveland livery complete with a white front. I'm sure Mr Henderson will be able to provide a full rundown of the North East's ETs if we ask him nicely? Added by Chris Hall Teesside UK on 19 April 2013. Added by Ronald Henderson on 19 April 2013. Added by Dave Elms on 19 April 2013. Added by Dave Todd on 19 April 2013. Thanks Dave - I could not figure that feature out for the life of me! Also - as I recall (it was 47 years ago) PBR 500 carried a 35 foot ladder, just like this one, which was an unusual feature on an ET in those days. Added by Rob Johnson on 19 April 2013. Added by Dave Elms on 21 April 2013. Ah Mr Elms, I have to correct you the Dennis ET's did carry Home Office type Alluminium 35@ ladders the only one's in the Brigade, as I had a similar experience on my Sub O practical at Durham when faced with detailing a crew from Durham to carry out a 35' ladder drill when most of the experienced crew had never touched one or seen one since training school, I was not a popular bunny when trying to de brief the poor crew on there little fu pah's. Added by Brett Clayton on 26 April 2013. Added by Steve smith on 15 May 2013. Yes Steve.....there was a Bedford based at Ferryhill prior to the Dennis.....there was only one pump there originally and they built a second bay. Added by Barrie Green on 15 May 2013. Added by Steve Smith on 17 June 2013. Added by Steve Smith on 29 December 2013. Added by Barrie Green on 30 December 2013. Added by Brett clayton on 01 January 2014. Added by Steve Smith on 03 January 2014. I have been wondering when Alfred Miles got started building fire appliances - and when and how they ended up ceasing production. So far, it seems the earliest units I have tracked down date from around 1954, and the versions with their own custom made front cowl - like this example - are first mentioned in 1957. Similar looking versions were also built on F8 chassis, after Dennis acquired Miles, but they were few and far between, as the F8 was discontinued fairly shortly afterwards. Do we have any historians out there, who can correct this information augment it or comment on their full history? Added by Rob Johnson on 23 December 2017.